Mitsubishi’s i-MiEV electric vehicle has been in use by corporate fleets since 2007 elsewhere in the world, but Mitsubishi has announced plans to release a mass-market model in the US by 2011. The car debuts at the 2010 LA Auto Show in November. 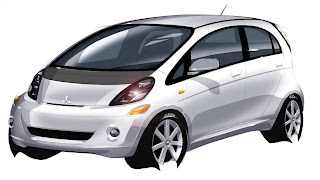 From leaked sketches, auto enthusiasts speculate that the US model i-MiEV will be wider than existing units. The planned 2011 US spec i-MiEV will also feature a more aggressive styling, particularly in its front fascia. While details on the upgrade have not been unveiled, current-models of the i-MiEV feature a 100-mile range, with a maximum speed of 80 mph. A wider body will also allow for better side impact protection in the event of a crash, which will ensure that the car meets US safety regulations. The i-MiEV is said to retail for less than $30,000, which is a lower price point than the comparable Nissan LEAF, which is priced at $32,780 before the $7,500 federal tax credit. The Mitsubishi i-MiEV is expected to reach the US market by the end of 2011.